So hear any could smack talk this week? WWE holds WrestleMania this week and thanks to MMA rumors plus some Tweets, Conor McGregor and Khabib Nurmagomedov are out here proving MMA is the ultimate version of pro wrestling. Everybody knows the UFC has leaned heavily on WWE’s playbook throughout the years. But when MMA is at it’s best, or sometimes worst, life can not only imitate but surpass any fictional art. Happy WrestleMania day. Don’t break kayfabe and spend some quality time with the ones you love; like your Sunday Morning Rumor Mill. 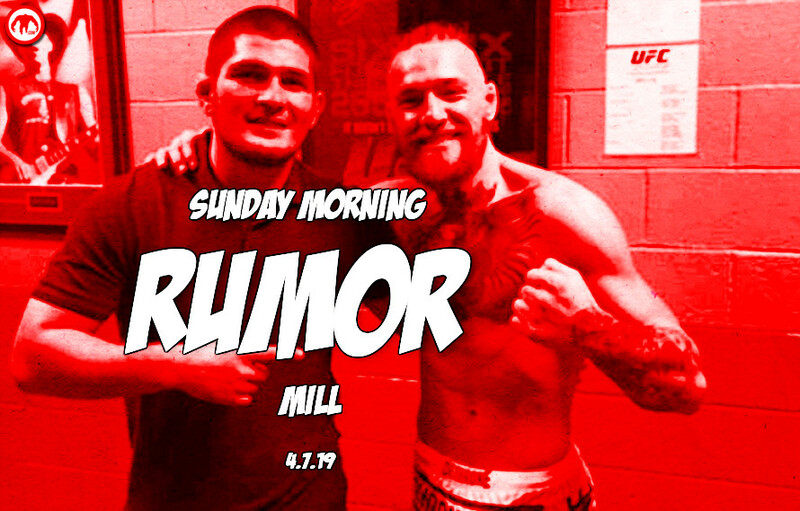 In part due to this week’s round of trash talk, rumor is UFC is now targeting a Conor McGregor versus Khabib Nurmagomedov fight for a Fall date. A rematch could fall eerily close to the one year anniversary of UFC 229. This gives some weight to previous rumors that UFC expected Khabib to return sooner than expected. Latest rumors put Ronda Rousey possibly taking some time off after WrestleMania. Rousey’s contract still is active with WWE, with a possible late summer return in mind for both parties. Rumors say Michael Chiesa versus Diego Sanchez is in the works for UFC 239. Huge if true, but rumor is Brock Lesnar’s WWE contract goes through June. This would allow Brock to take a title fight with Daniel Cormier in August. UFC is looking to book Pedro Munhoz and Aljamain Sterling into a bantamweight number one contender’s match in early Summer.